OK. So I realize selecting my favorite paintings of 2011 is completely subjective. I am sure you might disagree with some of my selections and if you want to take a look at the entire collection from the year, click here. But these are my favorites ... and not just because they sold or I like the colors. Some of them were painted quickly, others took days. Some sold and some did not. In fact, the ones that are not sold are: the "two sailboats" and "rooster" in the top row, the "under the umbrella" painting in the second row and the "yellow umbrellas" and "reflection of the pavilion" in the bottom row. Some are 6" x 6" and some are 11" x 14". The most interesting fact about my choices ... less than half are paintings of boats! So, what do you think? Which is your favorite? Technically, the holidays are behind us. I am pretty exhausted as I have been cooking for about three weeks, ever since the day our power came back on. I am planning on taking a few days off to relax and re-energize. I have a lot of big plans for the year as they relate to my art career and January is starting off with a big bang. Eleven commissions, a show opening on January 22nd and sold out workshops in January and February. I can't wait!!! The Twelve Days of Christms - Day Twelve! Day Twelve giveaway is the free 12" x 12" painting listed above and below. 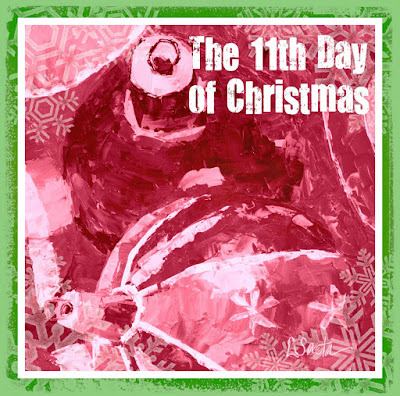 Day Eleven biz card/postcard/design help winner is Melanie Nogawski! I am giving away the painting that I used throughout my entire holiday promotion. It's one of my favorites and can be yours! It's a 12" x 12" original oil painting. The drawing for the painting will be held this Wednesday at 12:00 noon PST/ 3:00 EST. To be eligible for the painting, all you have to do is go to my website and click on the "recommend" button on any of the pages of my website or on any of my paintings. Be sure and let me know you have done so (just to make sure I don't miss anyone). Feel free to leave comments when you "recommend" if you want! This is the painting I am giving away! 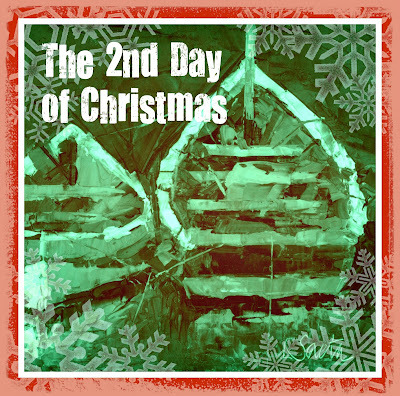 Thanks again to all of you who have participated in the Twelve Days of Christmas fun! I can't wait to give out this free painting. Happy Holidays! Day Eleven giveaway includes the creation, design and printing of marketing materials. I will design and print new business cards (250) and postcards (50) for your art business. 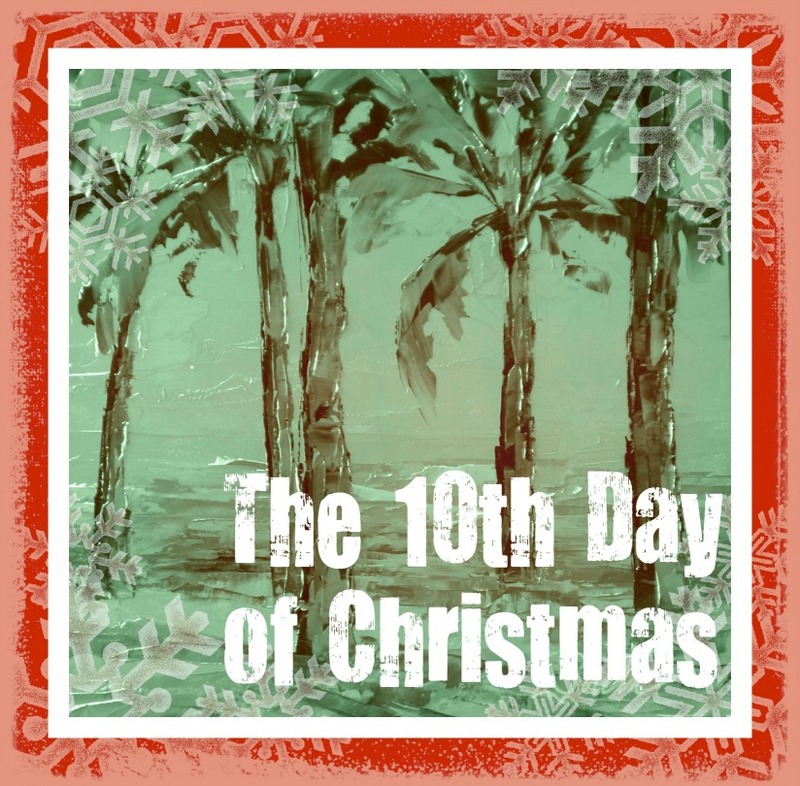 Day Ten Consultation winner is Kathy Cousart! Call it Lucky 13, but when the number"13" came up, Kathy was the 13th comment on my blog (I had 41 total comments on my blog/FB profile and FB fan page). It probably helped that she left lots of comments on all three sources! So congrats Kathy. The Day Eleven giveaway provides you the opportunity to upgrade your business cards and create postcards to promote your business. We'll brainstorm and then I'll design and once we have your approval I will print the items for you. This will be fun! To qualify just leave a comment on my blog or Facebook fan page and/or profile page with a question or "creative" idea for art marketing materials. 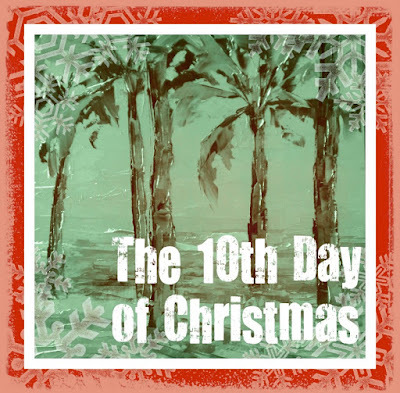 Day Ten giveaway is another 90 minute marketing consultation! 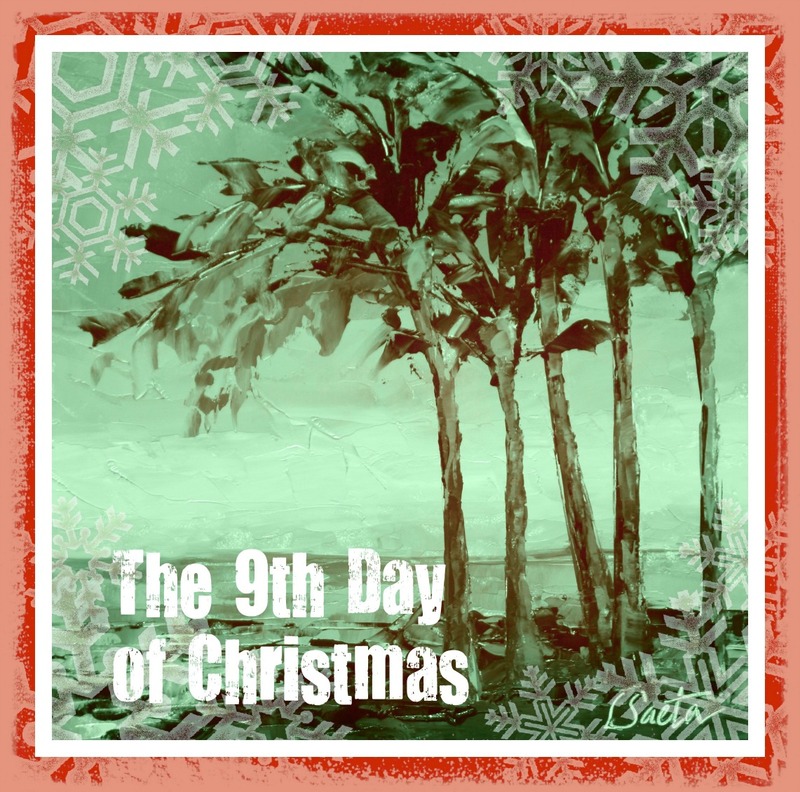 Day Nine Workshop winner is Janelle Cox! I decided to give away another marketing consultation because there were so many of you who wanted it and didn't win. So ... you now have a second chance! Just leave a comment here or on my facebook profile or Fan Page telling your fellow artists which marketing idea you wished you could learn more about! And you will be eligible for the giveaway. The more times you post, the more chances you have to win! I shipped two commissions today (in time for the holidays) and spent the rest of the time in the kitchen. Tonight I am cooking homemade Butternut Squash Soup and Spinach Artichoke Tarts. Only three more days until the party ... It's a crazy time of the year but I love it. 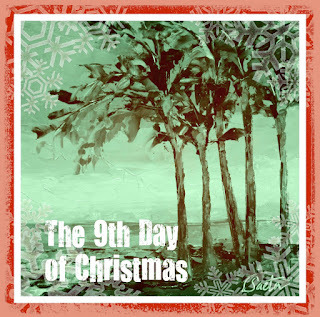 The prize for the 9th Day of Christmas is a Three Day Workshop with me! Day Eight Winner is Maria Bennett Hock. I wanted to have fun today with my Twelve Days of Christmas promotion so I thought it was time to give away one of my favorite things - a free three day workshop! You can select any of my 2012 workshops held at the Carriage House in South Pasadena. You just have to select one that is not already sold out! To be eligible for the prize go to my Facebook fan page or Facebook profile page (or both) and click SHARE on the post about the workshop giveaway. Also, feel free to leave any comments about your favorite things you have done at workshops. I am always interested in what others like about workshops they have attended. For information about the workshops at the Carriage House, click here. Good luck! 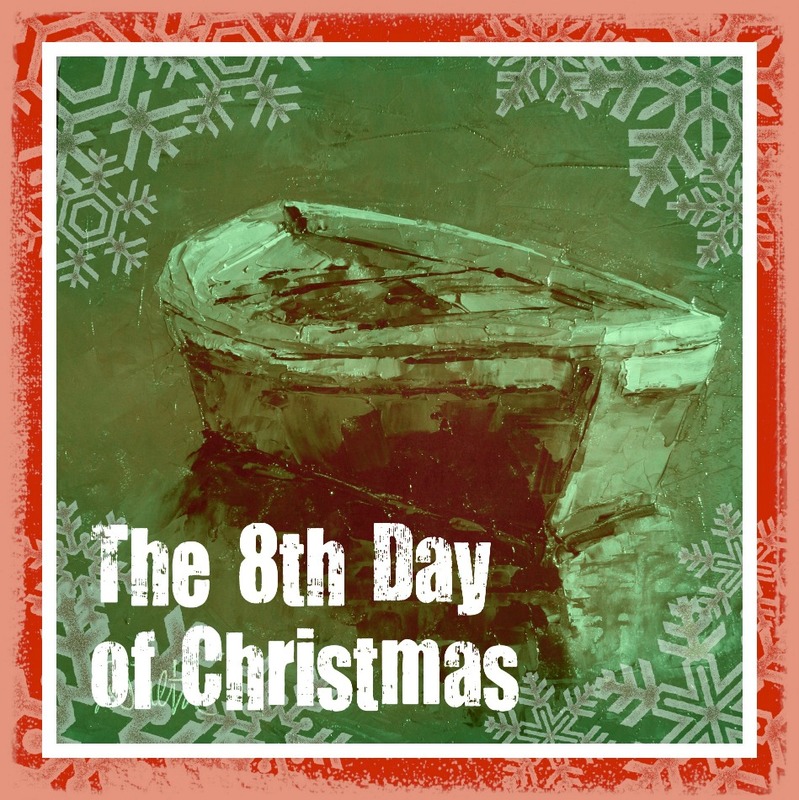 The prize for the 8th Day of Christmas is a set of my favorite palette knives. Day Seven Winner is Donna Aloia. To qualify for the Eighth Day of Christmas jut leave a comment here or on my Facebook Profile or Fan Page and let me know what your favorite art "tool" is! My favorite tools are my three palette knives and the lucky winner will be given a set. The "survey" I held for the 7th Day of Christmas had some interesting results. First off, there were 64 people who "voted" and 43 different paintings were selected. I guess the results prove once again that different types of art appeal to a lot of different people. Somehow I imagined there would be fewer paintings selected. But I am thrilled with the results. The most favored painting was "Just Waiting" and it can be seen here. Currently it's on display at the Debra Huse Gallery. Finally, don't forget, my paintings are 20% off until December 15th! 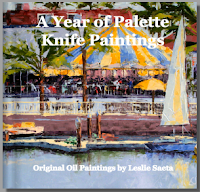 The prize for the 7th Day of Christmas is a copy of my new book, "A Year of Palette Knife Paintings". 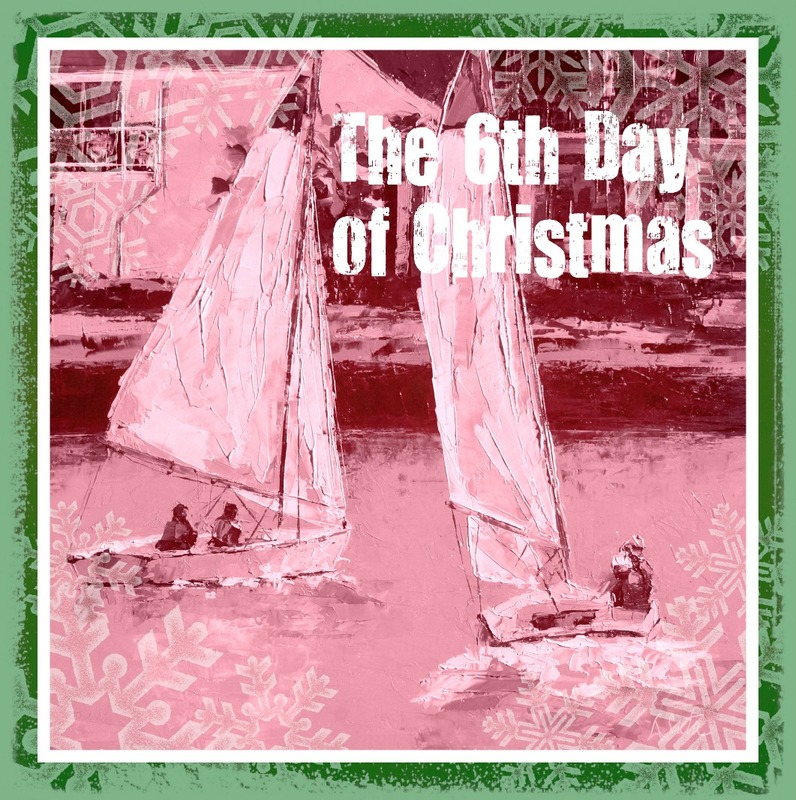 Day Six Winner is Katherine Fleming! 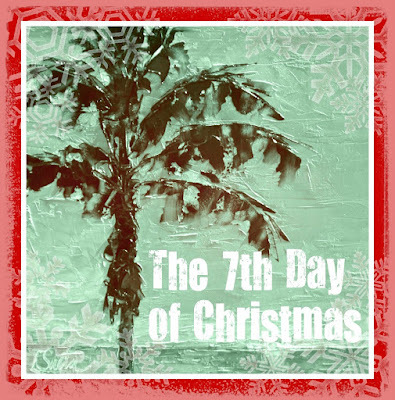 I cannot believe we are already on the 7th Day of Christmas giveaway! Today's prize is a copy of my new book and I just received a box of them so they are ready to ship! And all you need to do to qualify for this giveaway is go to my Available Paintings and let me know which painting is your favorite. I am working on my goals for next year and I would love your input to know which paintings are most liked! Leave your comment here or on my Facebook profile or fan page. Thanks! 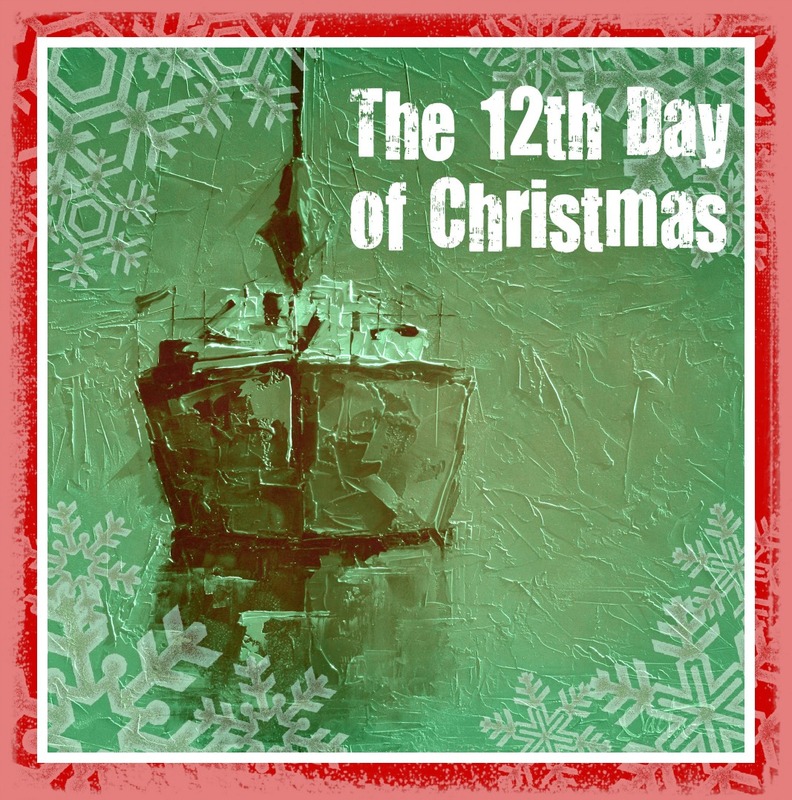 The prize for the 12th Day of Christmas is a custom painting apron. Day Five Winner is Lisa Payne! During the holidays I think it is important that we try to support artists in any way we can. So when you are making your gift lists, try to support your fellow artists! So many artists have incredible art, gifts, notecards and lots of things that can serve as a great holiday gift! 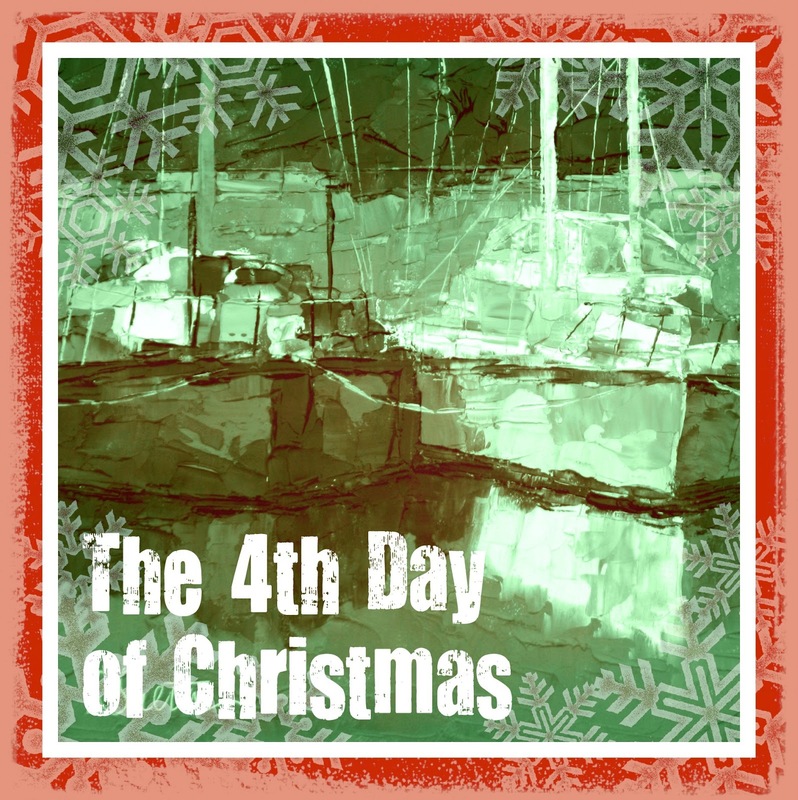 And if you want a print of some great artwork, Imagekind is currently offering 40% off! The sale lasts until midnight on December 11th. Here's the promo offer. And to find my store on Imagekind, click here! the word about wonderful artists. So have fun sharing! Today's giveaway is a Marketing Consultation! 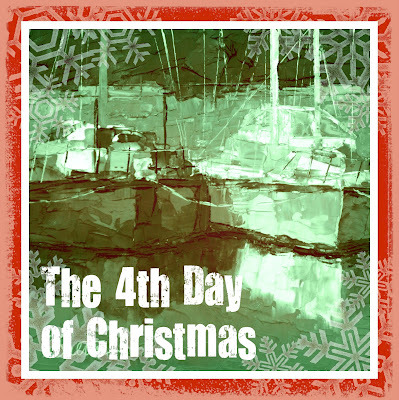 Day four winner is Debbie Lamey MacDonald. Today's prize is a Marketing Consultation. If you have been listening to my radio show, "Artists Helping Artists" you will know that I have lots of ideas and suggestions when it comes to selling art on-line. We can discuss new ideas for your website and blog, put together a plan to create marketing materials, get you signed up on facebook, whatever you need! This is your chance for personal one-on-one marketing advice ... with an artist ... who knows exactly (from personal experience) what you need to do to sell more art. 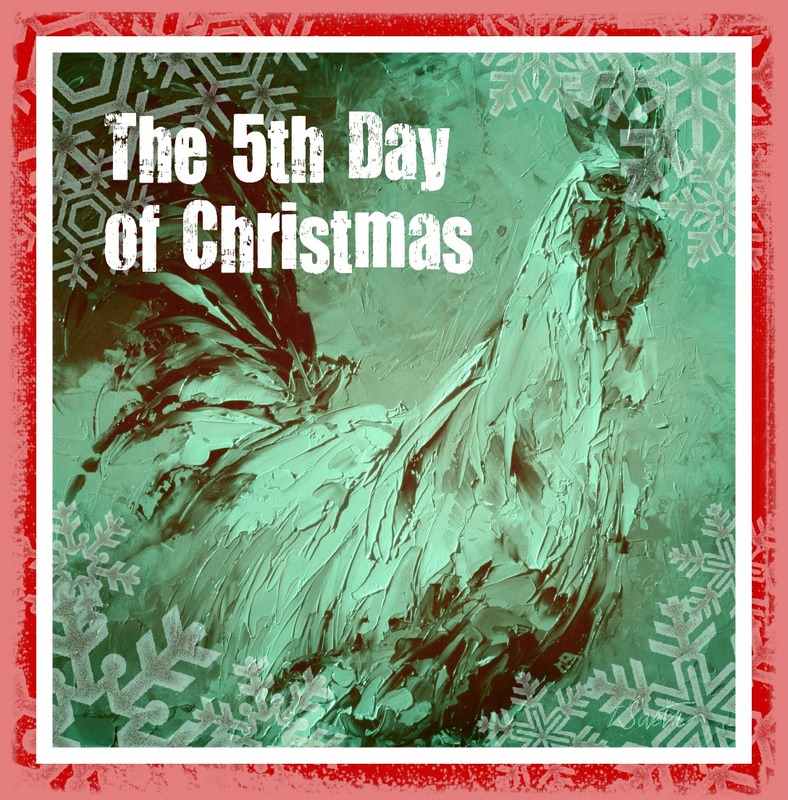 To qualify, all you have to do is go to my Facebook Profile and/or Facebook Fan page and click SHARE at the bottom of today's post about the 5th Day of Christmas promotion. That's it (and if you share both you can qualify twice!). Today's giveaway is 25 holiday note tags! 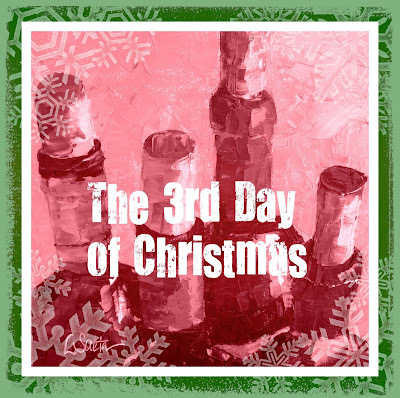 Day three winner is Dianne Hart. Sorry that my promotion took a "no electricity vacation" but with everything happening in our town it was just too hard to run around looking for internet. We do have power and "some" food in our refrigerator and I have made a huge dent in cooking for our party but we are still without phones and Internet. So I am at a friends house "borrowing" her Internet. The winner of Day Three, which was a print of one of my paintings, is Dianne Hart. Thanks to all of you who sent in many great ideas for the AHA radio show! Tomorrow's prize is 25 holiday gift tags (which will be mailed asap) and all you have to do to qualify is leave a post on this blog or my facebook with ideas for titles for boat paintings! The more ideas, the more chances you have to win! Thanks to the nealy 100 people who entered the contest today! I am actually sitting at a coffee shop (which has power, unlike my house) with my husband and two great friends. (My girlfriend said to hold off on the photo since we had no power ... hence no blow dryers ...). Anyway, I used random.org and sure enough, one of my favorite artists Kathy Cousart won! Congrats my friend! Tomorrow's gift is one of my new 2012 Calendars. To be eligible for the prize, all you have to do is go to my Facebook Fan Page and LIKE me. If you are already a fan, just leave me a comment either here or on my Facebook fan page and you will be entered. Good luck! And for those of you who didn't win ... you will all be entered in to the grand prize drawing on the final day! Facebook Fan Page. 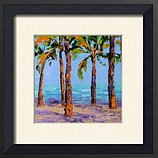 Today's Giveaway - an 11" x 11" unframed print titled "Palms on the Beach". To win this print, all you need to do is help out Dreama and me and suggest show topics for the "Artists Helping Artists" radio show. We are always looking for great ideas and artists to have on the show, so please help us out! Leave a comment here or on my facebook and the print could be yours! Check out my upcoming palette knife painting workshops at http://www.saetastudio.com/Leslie_Saeta_fine_Art/Workshops.html. 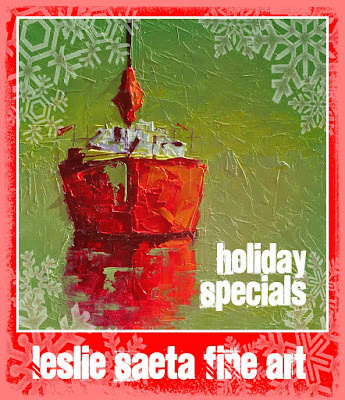 Check out my upcoming palette knife painting workshops at http://www.saetastudio.com/Leslie_Saeta_fine_Art/Workshops.html. It's the most wonderful time of the year! That's right! It's time for my annual Holiday Giveaway. 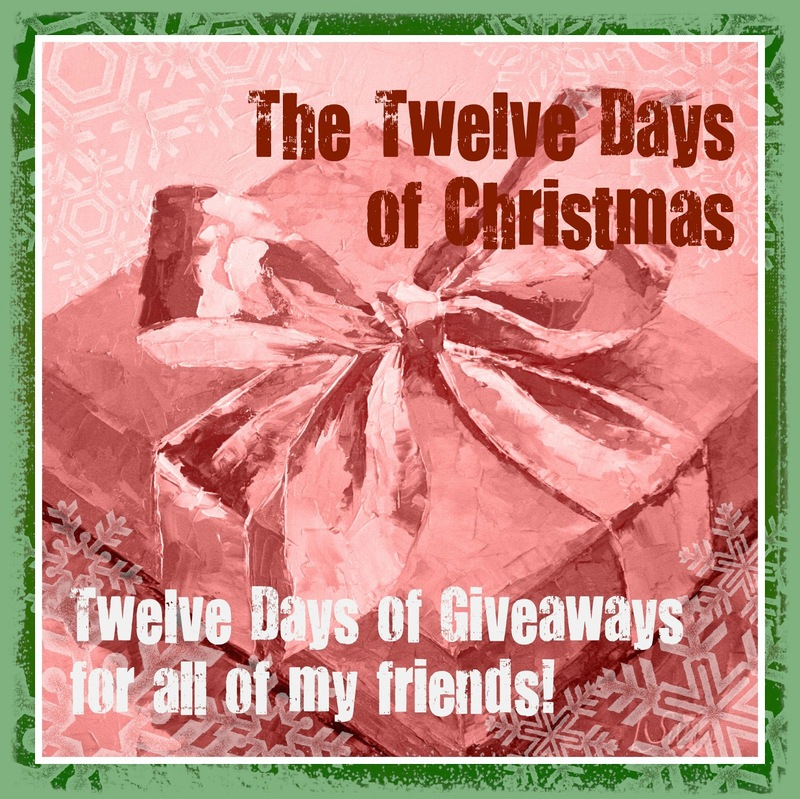 For twelve straight days I will give away lots of free gifts. The items are great and a few are valued at over $200.00. Every time you participate in the daily "Twelve Days of Christmas" giveaway you are also earning chances to win the last day giveaway (which is the big prize!). So, it helps to participate everyday. 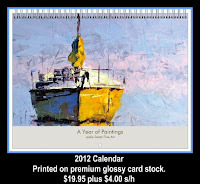 The first day giveaway is 15 note cards, valued at $45.00. All you have to do to be eligible is leave a comment on this post on my blog, my facebook page or my facebook fan page. The winner will be announced on Day Two! After putting away the last of the turkey leftovers and dropping two kids off at two different airports, I finally made my way back in to the Carriage House to paint. I put some finishing touches on five paintings I had going at the same time (I know, its scary but deadlines prevail!) and am ready to start on a few new ones tomorrow. Today I made the drive south to Newport to visit two of my favorite people: Randy Higbee and Debra Huse. Randy owns the Higbee Gallery and Art of Frame Company and I needed some frames for three 6" x 12" paintings. After the paintings were nicely framed I took them to the Debra Huse Gallery. I have two shows opening this weekend. The first, as I mentioned, is the Debra Huse Holiday Treasures show. It opens this Thursday night with an opening reception from 6:00 until 8:00 p.m. The second is the Randy Higbee 6" Squared show which opens on Saturday. Don't miss the 6" Squared Opening Reception this Saturday, December 3rd from 5:00 until 9:00 pm. Click the links for more details. I have a complete schedule of workshops that I will be teaching next year. There is a good chance I will be adding adding another workshop in the spring in the North Carolina area but other than that, the schedule is pretty full. Most of you have heard me mention that teaching is one of my favorite things to do and the small and exclusive classes in the Carriage House are an amazing learning experience. 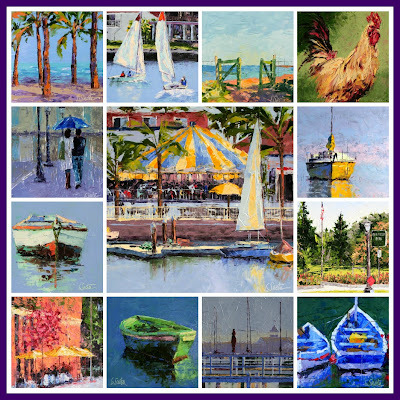 With eight students or less, the classes are really intimate, personal and incorporate just about everything you would ever want to know about color mixing, values and palette knife painting. When my husband and I decided to convert an old carriage house in our backyard in to my new studio, I knew I had finally found the perfect location to teach. Offering workshops in the Carriage House, which was built in 1915, allows me the opportunity to invite my students in to my home and share what I am most passionate about ... my family, my home and my art. Because of its size, these workshops are limited to eight students. The intimate nature of the workshop allows me the chance to develop both the skill and the motivation of all of my students. I have added an Advanced Class in April that will focus on "direct" painting at a quicker pace. All of my students have commented they wish they could paint faster, so this is your chance! For information on how you can qualify for the Advanced class, follow the link below. Leslie & Dreama’s Workshop Feb 13-17, 2012 Atlanta, GA - two spots left! 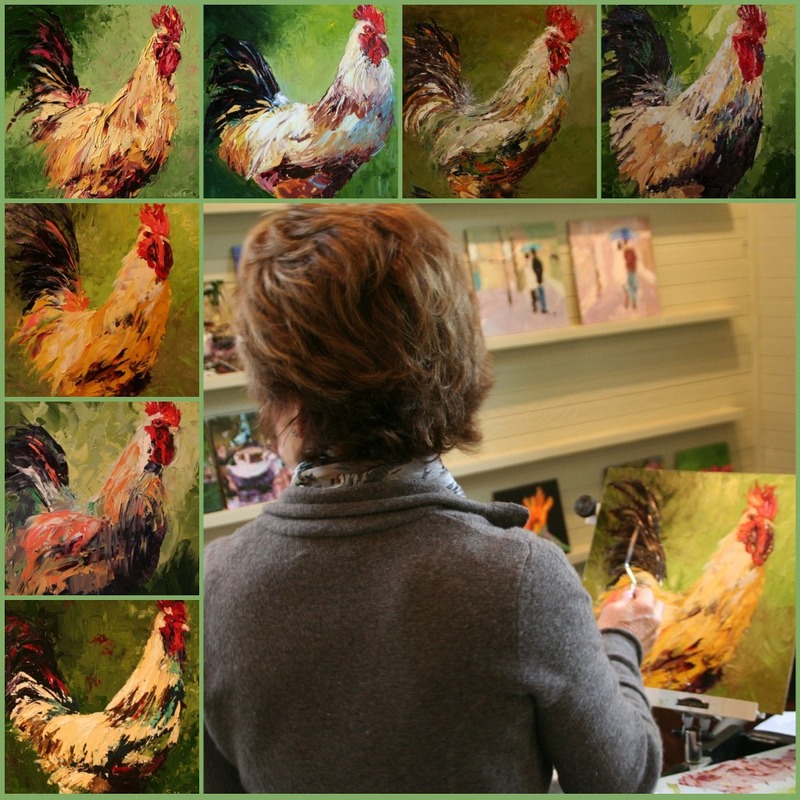 Here are the 7 rooster paintings from the workshop. On the third and final day of my palette knife painting workshop we painted roosters. By the final day all of my students had a very good understanding about how to paint with the knife (we had practiced a lot!) and as you can see from the finished paintings ... wow! They were all slightly different and unique to each artist. I am pretty sure we will paint roosters in all of my workshops! On Day Two, we painted boats (and reflections). Since we had been studying values, I chose a darker photo to study so we could make sure to stay true to the values. Once again, here are more great paintings! 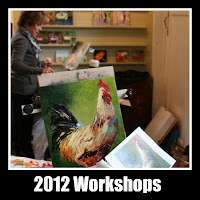 I just added to my 2012 Workshop Schedule a new April Palette Knife Painting Workshop in the Carriage House Studio. The dates are April 2, 3 and 4. Since January and February are already sold out, don't hesitate to sign up soon!